For a contingent of long-suffering fans, tonight’s Kiss concert at Save-on-Foods Memorial Centre will be the realization of a dream 36 years in the making. A crowd of more than 6,000 is expected to watch the legendary rock group play its first-ever concert in Victoria tonight at the Blanshard Street venue. In the audience will be longtime fan Steve Barrie, who has waited decades to see the band perform in his hometown. In fact, Barrie has been waiting to see the group behind the hits Rock and Roll All Nite, Beth, and I Was Made For Lovin’ You since July 25, 1977. That was the infamous date of a Kiss concert scheduled for the former Memorial Arena, which was cancelled three days before showtime. “I wasn’t originally allowed to go, because I was nine years old,” Barrie said. The mother of one of Barrie’s childhood friends eventually bought him a ticket for what would have been the last stop on the band’s 15-date tour of Canada. For decades, rock fans in Victoria have speculated about why the concert was cancelled. It has lived on in local lore — a framed ticket to the show used to hang on the wall in Legends Comics on Johnson Street — in part because of the cancellation. Close to 5,000 fans were expected to attend. When the concert was called off, the Victoria Times ran a news story under the headline Kiss Goodbye Leaves Arena Brass Furious. There was speculation that Victoria police had shut it down, or the fire department. Others blamed the band’s excessive use of pyrotechnics, which might have torched the roof, setting the insulation ablaze. The official reason, according to John Bate, the Memorial Arena’s assistant manager at the time, was the lack of trusses in the venue. There was no way to hang the vast amount of production elements Kiss used in its set, Bate said. Like Barrie, diehard Kiss fans Clark Mantei and Donnie Black also missed out on the 1977 concert. All three will be in the room tonight. Each one said he wouldn’t miss it for the world. Barrie was once a member of the Kiss Army, the group’s legendary fan club, and often wore his members-only Kiss gold chain to class at Margaret Jenkins Elementary. 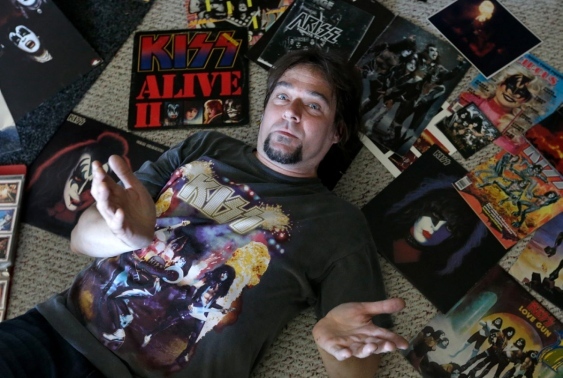 Black, who frequently dresses as Kiss bassist Gene Simmons for functions, has seen Kiss perform nine times since 1988, while Mantei owns what some consider one of the biggest Kiss memorabilia collections in existence. He even plays drums in the Kiss tribute band, Arise. Tickets for the 1977 concert cost $9.50; seats for tonight’s performance top out at $126, plus service charges. If his first Kiss show is anything to go by, Mantei expects a stage show unlike any other in Victoria. “When I saw them in Tacoma, Wash., on Aug. 31, 1996, I was laughing and crying and singing,” Mantei said.